Little Shop of Treasures offers a slightly different spin on the hide-and-seek game category made popular by the Mystery Case Files series. 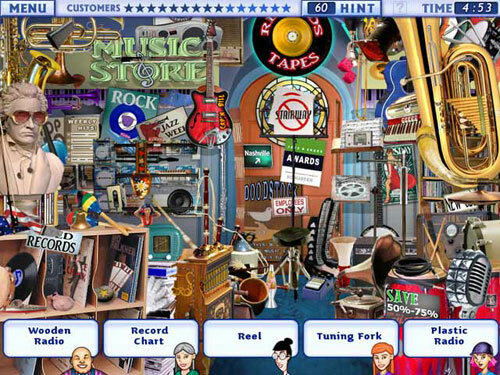 It's similar in that you're looking around for items in a jumbled room full of stuff. Instead of giving you the full list all at once, the game feeds you five items at a time, in the form of people making requests for the specific items. As you locate an item, the person wanting that item disappears and a new person pops up with a different request. The hinting system is a little different too - instead of making it easy for you to find the one item hinted at, the text request for an item changes to an image, which helps identify what the person is looking for. If you find a question mark hidden in the level, it adds an extra hint to your number of available hints. As you complete levels, you are slowly rebuilding the shop you want to open in town, which is the goal of the game. If you like puzzles, Little Shop of Treasures is definitely worth trying out.